Gate B12 was more crowded than usual on this early february afternoon at Athens International airport. 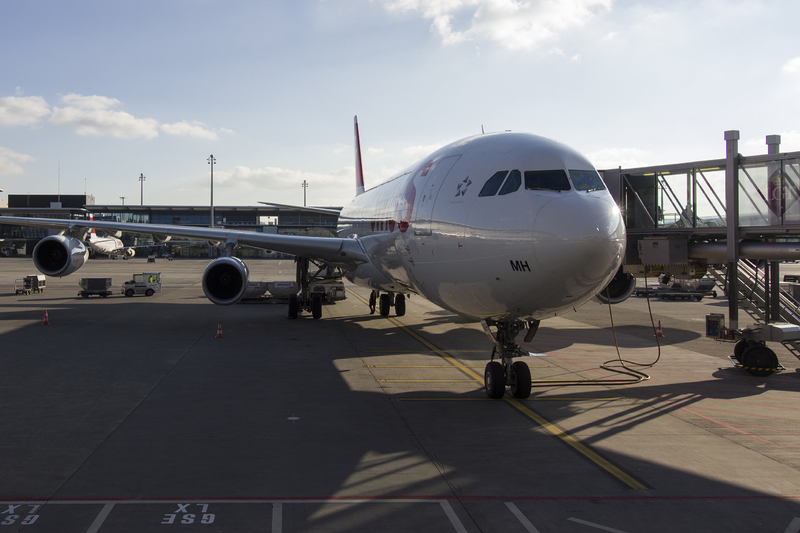 That day, Swiss flight 1831 to Zurich wasn’t operated by the usual narrowbody A320 family, but an Airbus A340! Two weeks earlier, I was interrogating google flights for a good price / type / date combination for Athens sometime in february or march. The price was surprisingly good, but only with A319/A320/A321/ RJ100 combinations on either direct or 1 stop flights in ZRH. Aegan had direct returns for 90 euros with many dates available, and I was starting to lean towards that option. Then out of nowhere, on a random 16-18 february search, I couldn’t believe what I was seeing : a Swiss A340 showed up on the return leg! 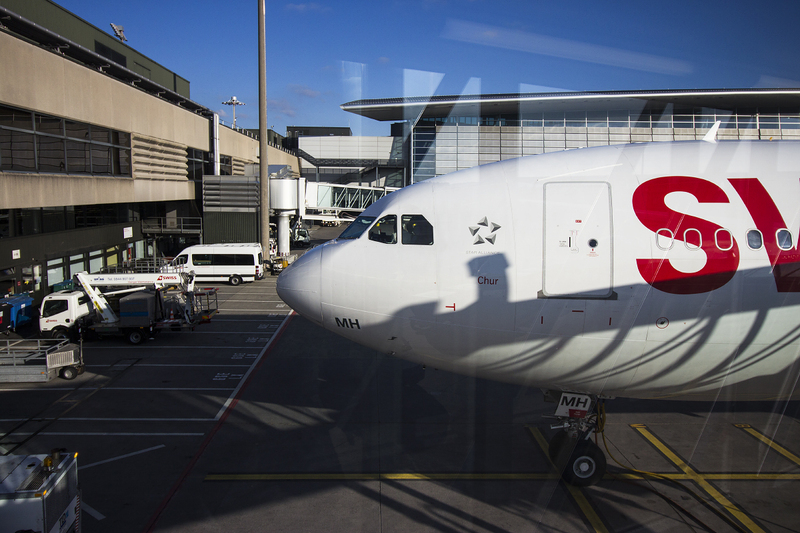 It was too strange, so I went to the swiss website to confirm, and indeed, it was an A340! After going through all the booking options, a pop up came up offering respectively a 79 and 63 CHF upgrade to business. This was tempting, since I had never flown in C before. At first I thought that’s a pretty good price, but then i figured it would be better to try it some other time on a longer flight. “Here’s you boarding pass sir. Business”. That didn’t register right away in my mind though. I checked the boarding pass hoping to at least have a window seat instead of the original middle row isle in the back of the cabin. Instead, it read 12D. Wait, isn’t that business? I just got an upgrade! Economy was completely full, and once onboard, I noticed a few other people got the lucky pass as well. 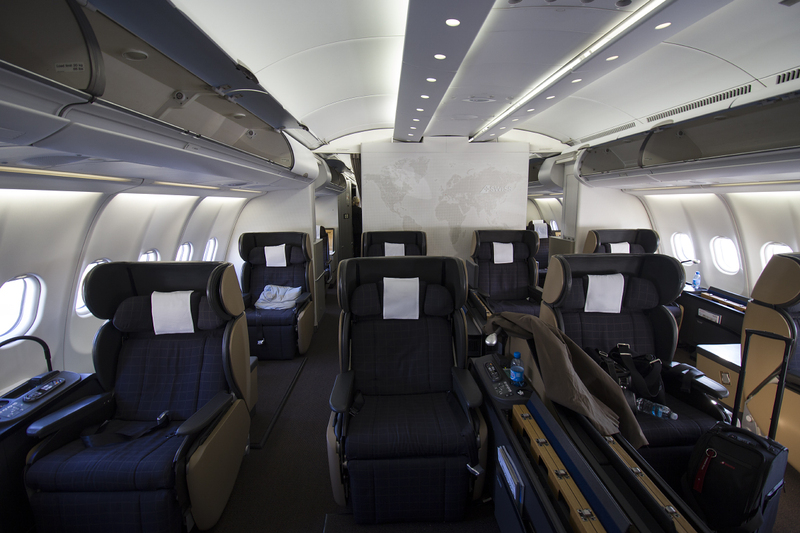 Others were seemingly more used to C class travel and were already comfortably settled in their seats and relaxing! 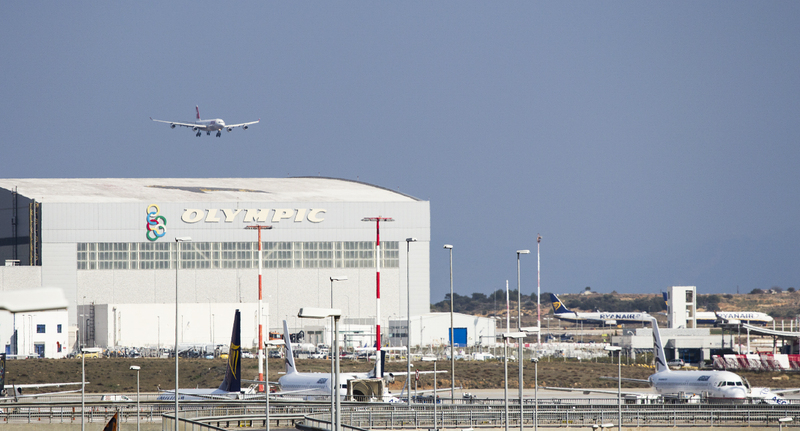 It was soon time for to get in the air and after a short taxi and an even shorter takeoff roll, our Airbus lifted off into the mediteranean sky. 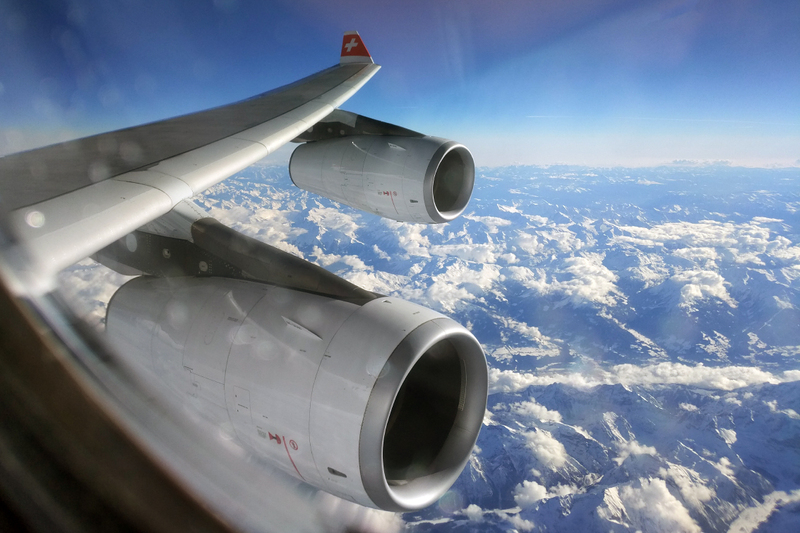 I’m writing this as we are on our final descent, landing in ZRH in about 20 min. The flight was super smooth so far. The seat is moderately firm, has more than enough legroom and is very comfortable. 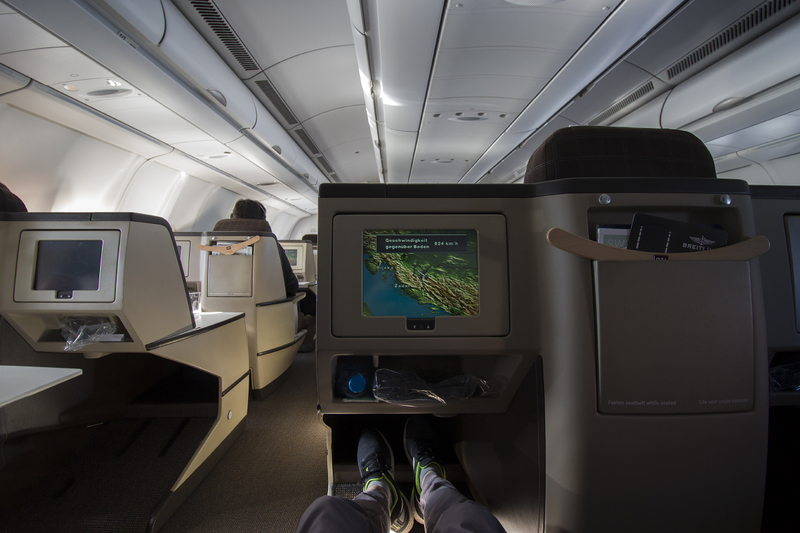 I was suprised how much of a difference the business class makes to overall comfort compared to economy. It seems like any flight length would be a breeze. The infinite seat settings combinations make it possible to make slight changes and find a comfortable position. I find the massage function doesn’t do too much, and is probably best in the lounge position where you have more weight on your back. Although it didn’t quite compare to one of those professional massage chairs, it did feel good. 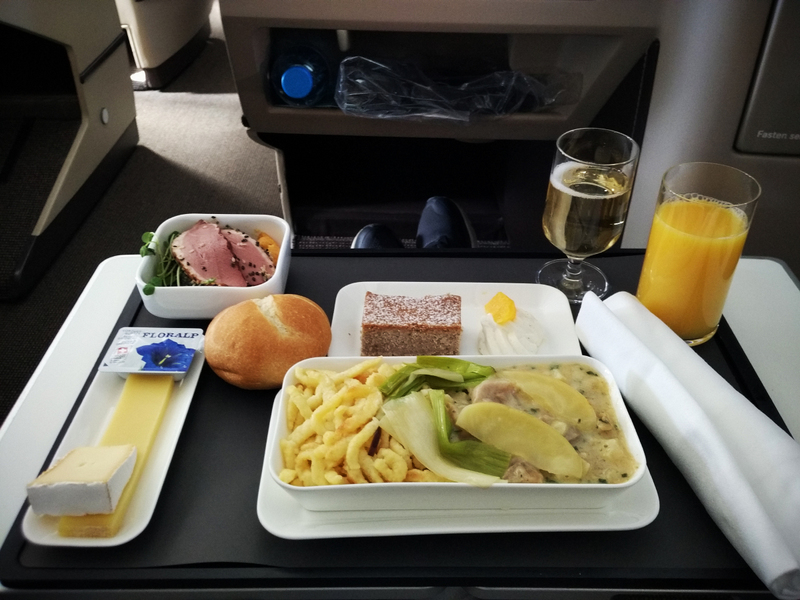 I wasn’t too hungry after having had lunch about an hour earlier, but that didn’t stop me from digging into the inflight service with a little glass of champagne. 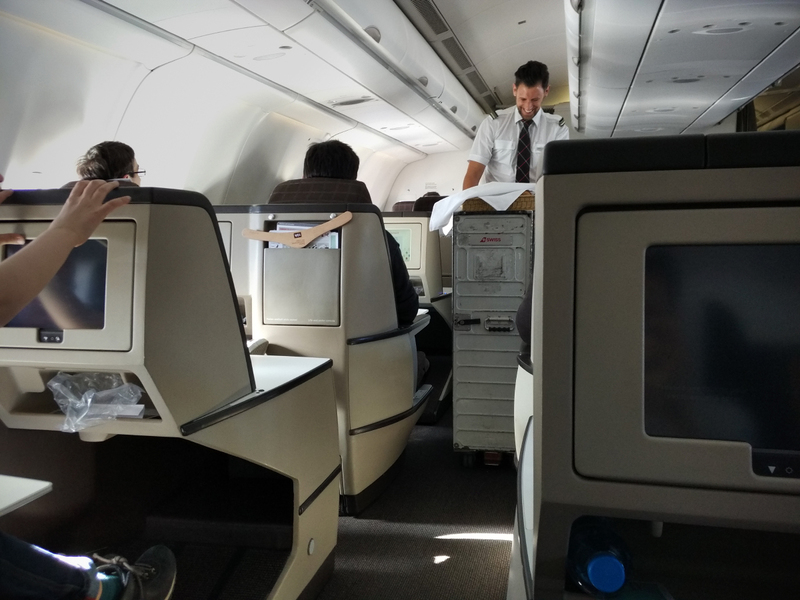 The cabin crew were very nice and attentionate, and definitely proactive. I asked the guy FA if they often fly the A340 to a ATH, and apparently, in 11 years flying it was the first time he flew it on ZRH-ATH. I asked another flight attendant if they had other flights that day, and she said this was her last leg of the day, they only do the 2 flights. 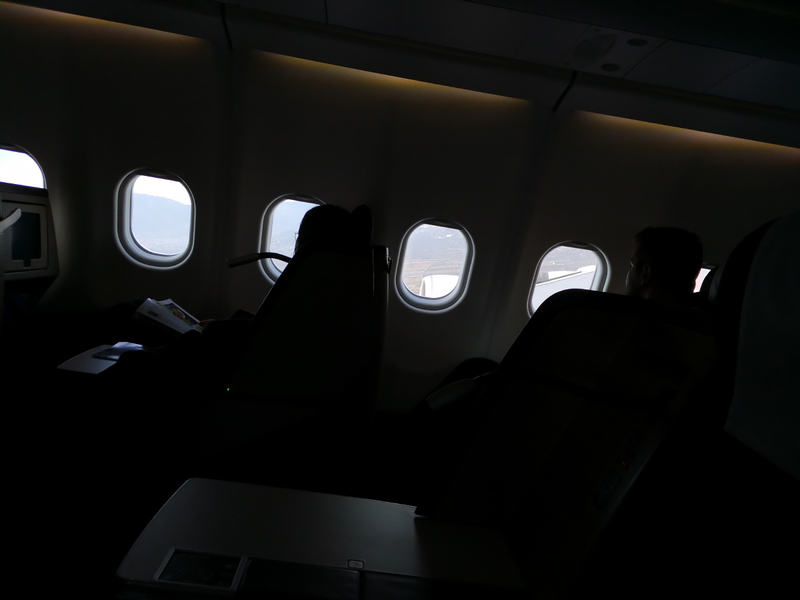 The following picture was taken from the front galley, through the tiny window in the aircraft’s door as we were flying over the alps. As for the the entertainment system, it is a strange mix between old and new. 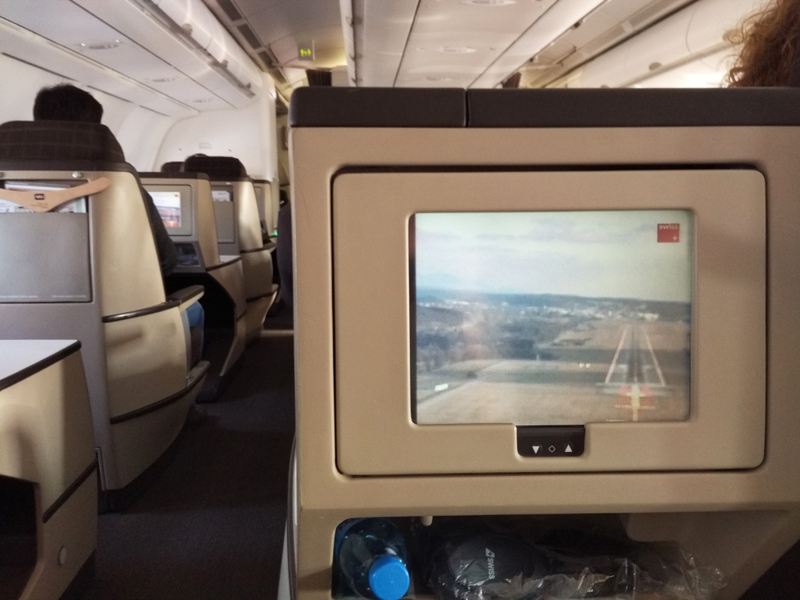 The UI is up to date, whereas the nose and belly cam are technology from the 1990s, and the screen has a distinctively lower resolution than say the company 777 IFE. 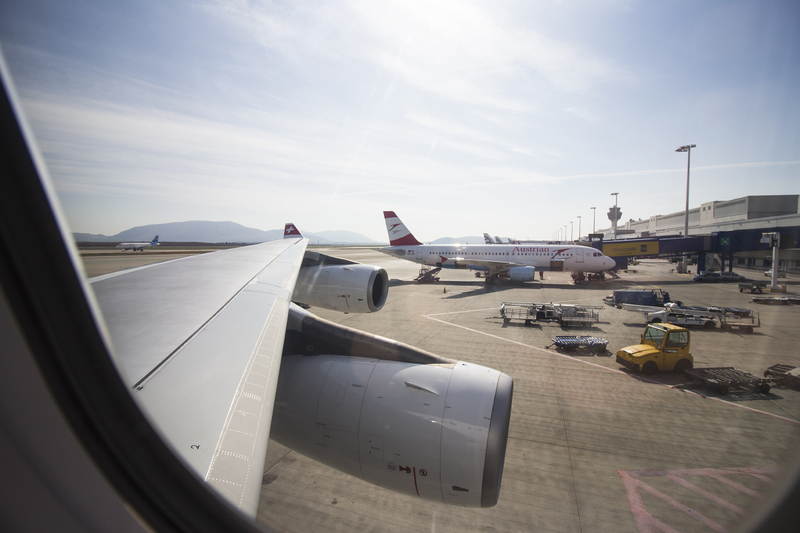 We landed at Zurich on runway 14 with a slight crosswind. 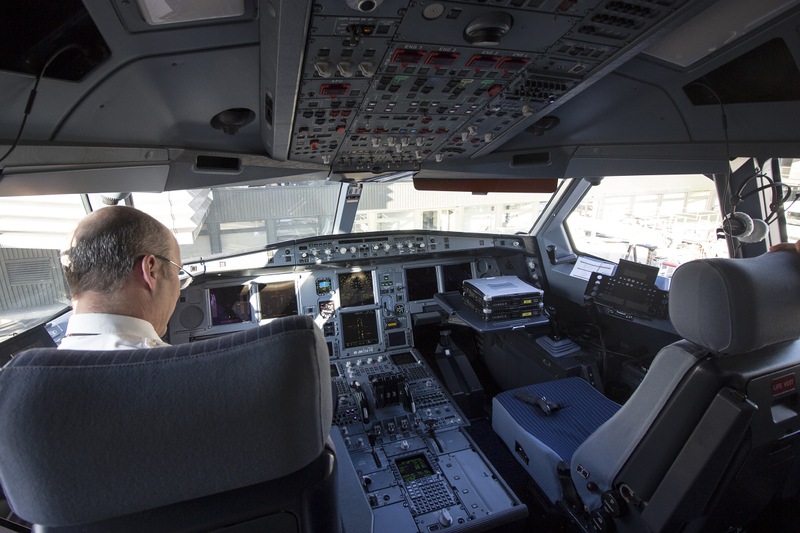 Before leaving, I asked to say hello to the pilots and after a quick chat, I was off for my second flight of the day to Geneva. We waited in the A320 for about an hour to allow for some bags to be unloaded from containers in the front and back of the aircraft. After that, we taxied straight to runway 34 and blasted off into the sunset. After a 25 minute in the air, we passed the Lac Leman and did the long approach from the South-West onto runway 05 at Geneva. 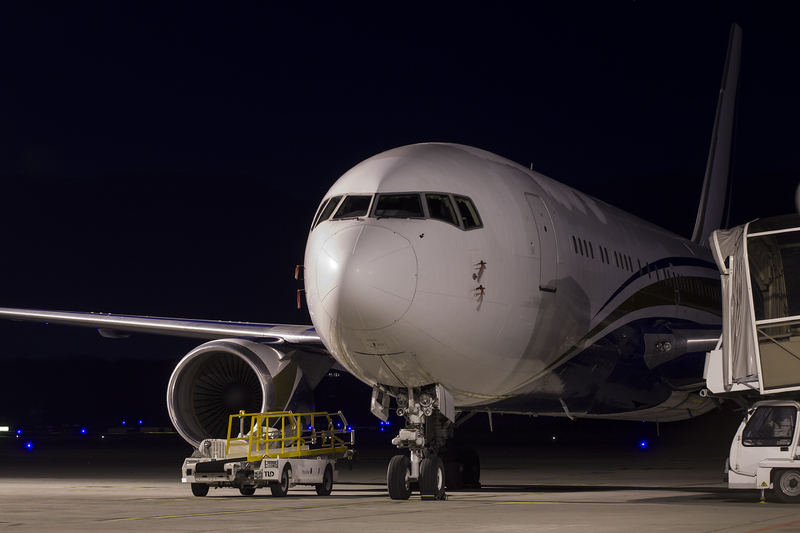 From the ground, I spotted a private 767, so I had to check it out before getting on the bus back to Grenoble.